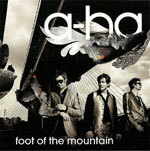 The first single from a-ha's forthcoming album "Foot Of The Mountain" is the title track. It was released to Norwegian radio stations on 24 April 2009 and available for download only in Norway from 4 May 2009. The single was released in Austria, Germany and Switzerland on 22 May; Denmark on 25 May and was available as a UK iTunes download on 13 July. Germany was the only country which got a physical release. The cover of the European release is largely black and white with a hint of red. It features a shot of the band (Magne, Morten, Paul) standing outside. 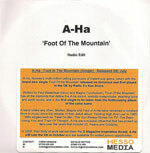 A new style a-ha logo is printed in large white letters at the top, right hand side of the sleeve, with the title in white letters at the bottom. The sleeve has a white border around the edge. It features two tracks, the "Radio Edit" (3:44) and the " Album Version" (3:57). The CD comes in a jewel case with a grey information sticker which reads "BRAND NEW SINGLE! 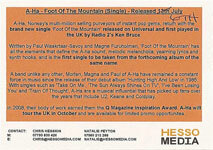 From the upcoming album "Foot Of The Mountain"" and includes a list of the tour dates. The back sleeve is of similar colour to the front, featuring some leaves in front of a skyline or building and telegraph poles. The track information is printed in the top left hand corner in white letters. The disc itself features a black and white shot of some rocks(?) 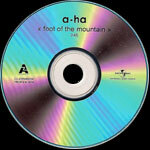 with a large white a-ha logo across the centre which is cut off at the edges. The title and additional information is printed in white at the bottom. The German two track promo comes with a paper insert. The front is similar to the regular release, whilst the reverse is white with black text, including track information plus the text "Not for Sale - For Promotion Only". It features the same tracks as the regular German release. There is a one track UK promo CD single which features the "Radio Edit". The front cover is similar to the regular European release, but is a folded paper insert without a white border around the edge. The back sleeve is white with black text. 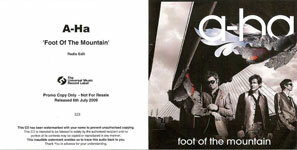 "A-Ha 'Foot Of The Mountain Radio Edit" is printed at the top with "Promo Copy Only - Not For Resale Released 6th July 2009" underneath plus additional copyright text and The Universal Music Record Label logo. It comes in a vinyl, envelope style wallet. 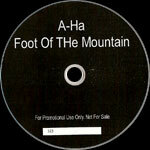 The disc is a CD-R with a black sticker and text in white "A-Ha Foot Of THe Mountain For Promotional Use Only. Not For Sale". A unique number is printed in black on a white strip and on the back sleeve (e.g. "369", "323" and "7" are known to exist). Some copies of the promo come with a large orange sticker stuck on the back of the PVC wallet with some facts and UK contact details at Hesso Media. Other copies have white nonstop Promotions and Copmedia information stickers on them. Another UK one track numbered promo comes in the same paper sleeve, but the disc is white with black text. The disc also comes with an orange HESSO Media sticker but the release date is listed incorrectly as 13th July and amended by hand to 6th. The UK iTunes download includes four mixes of the song: Radio Edit (3:44); Album Edit (3:57); Erik Ljunggren Remix (4:49) and Bohème 7" Remix (6.59), but there is no cover art with the download. Belgium: There is a 2-track promo from Belgium which comes in a PVC sleeve. The disc has a white vinyl stickered label with title and track listing at the top in black. The Universal logo is in black on the right hand side, a disc number at the bottom of the disc but some copyright and promo information. The tracks are the same as on the regular European release. 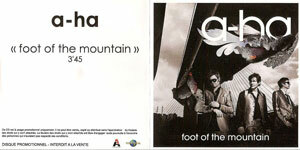 France: There is a 1-track French promo of "Foot Of The Mountain". The CD comes in a clear plastic wallet with a paper insert. The insert is similar to that of the UK promo, although the back sleeve differs slightly with quotes printed around the title and promotional text along the bottom of the sleeve. The disc is silver with black text. It features the radio edit which is listed as 3'45. The Netherlands: There is a 2 track CD single from The Netherlands which comes in a cardboard sleeve. It features the same two tracks as the German release, but the track lengths are listed as 03:43 and 04:00 respectively. The front cover is similar to the German release, but the title is printed further to the left. The back sleeve is also similar, but with the addition of a bar code up the bottom left corner. 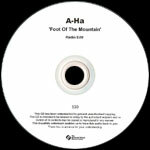 The disc is black with a large white a-ha logo across the middle and white titles below. 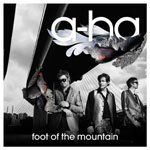 There is also a 1-track Dutch promo of "Foot Of The Mountain" and features the 3:46 edit. It comes in a slim-line jewel case with a picture card insert. The front of the insert is similar to the 2-track release but without the white border. The reverse is white with track information, pictures of the album artwork, album release date (12th June 2009), web links and Universal logo. For promotional use only - Not For Sale is printed at the bottom of the sleeve. 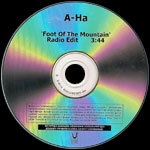 The disc has a white vinyl label with black a-ha logo, track information and Universal logo. Switzerland? : This one track promo is thought to originate from Switzerland. It comes in a PVC wallet with no insert. The disc has a white printed label with black text and features the radio edit (3:45). Text on the disc indicates that the album is due for release in June. The promo doesn't appear to have a catalogue number. Ukraine: There is a one track promo from the Ukraine, featuring the "Radio Edit". The CD comes in a PVC wallet and comes with a similar paper insert to the UK 1-track promo. The disc is silver with black text including contact information and Ukrainian Records label at the bottom of the disc. The paper insert also includes the same contact information and logo. There is also a two track promo from Ukraine which features the "Radio Edit" (3:44) and "Album Version" (3:57). It comes in a slim-line case with similar insert to the 1-track, but with the additional track listed on the reverse. The disc is silver with black titles. 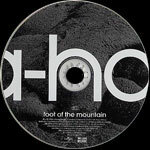 Belgium promo Foot Of The Mountain (Radio Edit) / Foot Of The Mountain (Album Version) Universal Music UNI [E] 2009/014?